A Very Serious Cookbook may be the serious-est cookbook we've ever seen. It's full of very serious stories about love and food and serious wine, centered on two very serious cool kids cooking in New York City's Lower East Side, at Contra, and Wildair, and Una Pizza Napoletana. Its pages feel good in your hands. Thumbing through the recipes isn't unlike getting lost in a museum; a vibrant one, where colors leap off the canvases and there's always an empty bench where you can let your eyes get a little glassy and really soak it in. 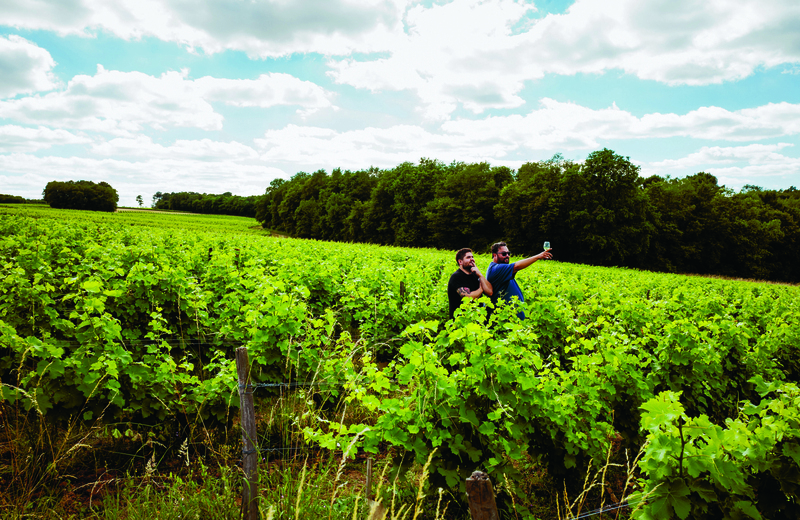 The combined palates of Jeremiah Stone and Fabián Von Hauske charm nearly everyone who strays into their path: Michelin, The World's 50 Best, that guy talking next to you at a bar, your mom. Eric Wareheim, who penned the very serious foreword of this book. What they've managed to do is harness individuality in a city of fervent individuals, to full gob-smacking effect. I loved the following excerpt right off the bat—mostly because the chemistry of a chef duo is a twisty, finicky artform. You can't beat watching two strangers collide and find the matching edges of their culinary brains. Growing up, the bulk of my diet consisted of chicken, eggs, and mostly potatoes. I never ate anything green other than the occasional broccoli stem, I didn’t eat cheese or butter, and if it had onions or garlic I wouldn’t even think of touching it. There is a strong chance I was the pickiest eater in history. The exception was Chinese food: My brothers and I were pretty much forced to eat everything by my parents. It’s for the best, because had they not, I would probably have starved. I first got into the kitchen when I was pretty young. I’d spend time on my mom’s lap making dumplings with her. I’d never make the right shape, but she was very encouraging, always letting me “test” out my creations. Surely Mom knew that the wontons in the shape of a crazy, irregular triangle or disfigured paper airplane would explode in the water and I’d be left eating boiled skins, but she always let me try. I never wanted to do what was traditional, even when it came to dumplings. Eventually, as my siblings and I got older, my mom would ask us to get dinner started when she worked late. Pretty sure chicken tenders were on the menu for about a year straight. Once my brother went to college, I started making food for myself and I went from being the pickiest eater to learning what it was that made me picky to begin with (which inherently expanded my taste). We grew up eating a lot of canned straw mushrooms and underripe, mealy tomatoes. As soon as I was exposed to fresh versions of those ingredients, my world burst wide open and my views on food changed completely. I started cooking more—for myself, for my family, and for fun. Eventually I even took over half the Thanksgiving meal, which became my favorite day of the year, my true happy place. Finding such pleasure in leading the biggest and most important meal of the year lead to me cooking for myself on a regular basis. I remember buying my first real knife (it was ceramic) and thinking, “Now I’m able to cut through a clove of garlic!” It’s the little things. Fast forward to my young adult life, after a failed attempt at becoming a famous DJ instead of going to college, a friend urged me to find a more traditional day job. My sister was working in a restaurant at the time as a server (she was also a part-time EMT!) and she got me a job at her restaurant, Houston’s. My first position was as a service bartender, and then I moved into the kitchen where I cooked and expedited. At some point my manager must have seen some semblance of potential and said it was time I go to culinary school to push myself further. I took his advice and enrolled in the first culinary school in Manhattan that would take me. I decided to cook out of pure necessity for my mental and emotional health. I must have been fifteen or sixteen years old and I kept wondering what I wanted to do for the rest of my life. At the time I could not imagine another day in school. I wanted to go out there into the world and do something real, create things with my hands, work hard, and see an immediate outcome. I had tried to get into music but that did not really do it for me—I didn’t see a future or any possible way I could make a living doing that. I wanted to be a graphic designer or a photographer, but I was never as good as my brother. I also didn’t want to go through the lengthy process of applying for college to then four years later realize I really wasn’t that good at any of it. Which brings me to food. My dad always took my family and me to nice restaurants growing up and that’s kind of the way I fell in love with food and restaurants. I found a job cooking at a small coffee shop/grocery store kind of place in Mexico City and just went with it. It wasn’t quite a restaurant, but they had prepared food, simple things like grain salads, rotisserie chickens, ribs, potato salad—kind of like a Dean & DeLuca. Even though I really enjoyed the process of cooking, my first days in a kitchen were awful. I was very shy and insecure at the time, and I definitely didn’t have the confidence needed in a kitchen. But I really loved cooking and eventually, as I learned, cooking became more natural and things got better for me. I was seventeen years old when I moved to New York. My older brother was moving there to get his master’s degree in graphic design, which was all the nudging I needed to move there myself. I decided to go to The French Culinary Institute (now the International Culinary Center), and that’s where my entire life and career changed. Like most people, when I arrived in New York, I had very few friends and no money of my own. I wasn’t old enough to drink or go out, so it was quite easy for me to just let the kitchen absorb me. I would go to school in the mornings and then spend the entire afternoon with Dave Arnold, who at the time was the dean of the culinary technology department. On the weekends, I’d work random events for him, or assist with classes he taught at The FCI. That’s where I met Jeremiah and all of this began. The most frequently asked question I usually get is, “Where’s Fab?” because yes, we’re pretty much joined at the hip. Sure, we are business partners, but more important, we’re friends. Despite several physical altercations in the walk-in, a few screaming matches, and one dislocated shoulder, we are very much loyal to each other to no end. 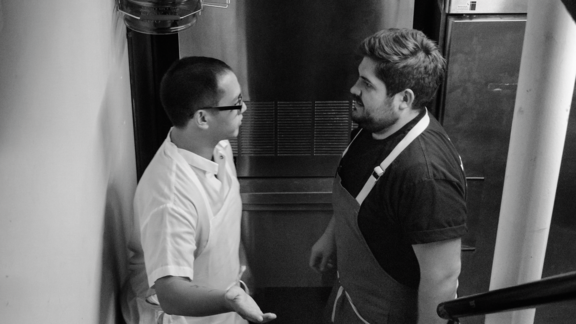 This dynamic has always helped with achieving our goals in the restaurants and with the food we create. We’re two very different people with very similar goals. It’s always been that way. We tend to work together where there’s just this consistent, silent conversation, with a basic understanding that comes from being around each other so much. Our joint honesty and openness has helped us create a style in food and restaurants that is both individual and connective of our personalities. I come from a mostly French, casual restaurant background, while Fabián’s resume is made up of more fine dining, destination establishments. I like to take risks and see how far I can go (with nearly everything) and Fabián is super grounded, keeping things in perspective for me with regard to my culinary daydreaming. We met through our good friend (my old boss) Dave Arnold at The FCI. I was working there as a sous-chef in the events department and Fabián had been interning with Dave. Fabián was a guy who stood out over time as someone who was always staying late and helping me out when I was in need of cooks. I’ll never forget needing to finish a ton of prep work for a big event the next day and Fabián offered to help us work through the night. What a guy, right? We stayed in touch as he went on to work for Johnny Iuzzini at Jean-Georges. I think I actually suggested Johnny fire him once when Fabián no-called, no-showed. Hopefully Fabián has forgiven me for that. I still remember the first time I officially met Jeremiah. We were all done with a class Harold McGee and Dave were teaching—it must have been one of those times where we had to get to school at 7 a.m. on a Saturday or Sunday and work all the way through 10 or 11 p.m. I was extremely tired, sitting down to relax for a second when Jeremiah came over to use the Cryovac machine, still obviously working. I forget exactly what he said, but it was some kind of snarky comment about me sitting down, not working, and I remember thinking how annoying he was and that hopefully I wouldn’t have to work with him often . . . funny enough. Needless to say, we didn’t really like each other at first. Months, and then years, passed and eventually we started getting along. Even then, there were these dumb little brother/big brother conflicts between the two of us. We’d be drinking in the theater at school and get into these physical altercations, which stemmed from arguing about literally anything. But we were always quick to bounce back, both of us able to put anything behind us for the sake of work. I truly think that’s one of the reasons why we ended up where we are. Lots of relationships in the culinary world end up bursting into flames. You see people getting together to open a restaurant and rarely does it last. Most chefs are very self-involved. I mean, you open your restaurant and every single little thing is about you. An entire group of ten to twenty people works countless hours to follow your singular vision. Everything is done to convey a representation of you as a chef. 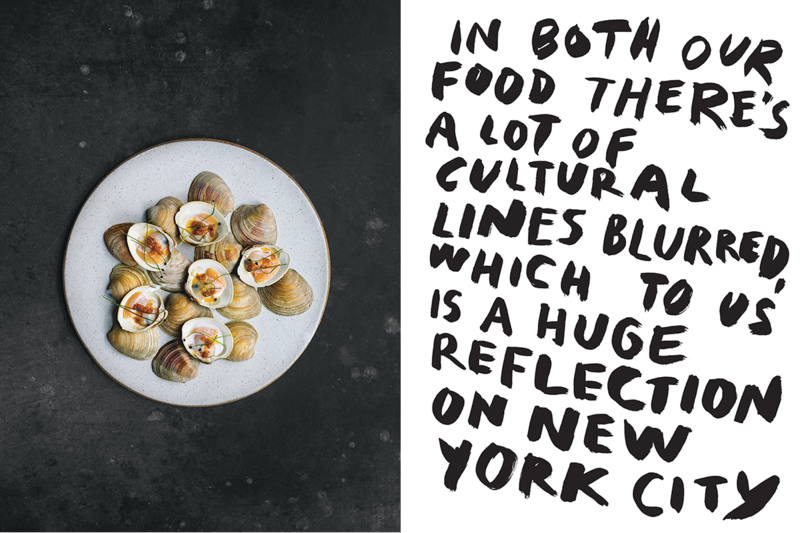 Excerpted from A Very Serious Cookbook, by Jeremiah Stone & Fabian von Hauske, published by Phaidon, October 2018. Use the nifty promo code FALL20 for a 20% discount over on Phaidon!